Right now, the real danger of monopolies and trade syndicates is on display. OPEC has refused to cut oil production, which is driving down prices. This is, on the surface at least, a very good thing. It is good for my pocketbook, and good for the pocketbooks of every struggling American in this era of rising income inequality. It is going to curtail inflation, keep interest rates low, fuel construction (pardon the pun) and a number of other things that will help the lower classes, and disadvantaged countries. Unfortunately, this action is not occurring for benevolent purposes, it is happening for the most cynical and selfish of reasons. If you dig deeper into economic policy, you see that this is a deliberate strategy to cripple emergent industries and to maintain hegemony. While it is not being done to commit deliberate evil, the ultimate results will do nothing but strengthen the hold OPEC has on the nations of the world. Further, at the end of this path, these low prices that we are enjoying will skyrocket, because that is the effect of a commercial syndicate when they have achieved market dominance. To understand why this is occurring, you need to look at two important things that are altering the landscape of the fossil fuel industry. The first thing is more or less a short term impact, the second is a much more sweeping change that will permanently alter the energy sector if it continues. First is the significant exploitation of the Alberta Tar Sands. (I want to note here, that I am not in favor of this project. It is an environmental horror that SHOULD be stopped. In this piece, however, I am exploring the economics, not the ethics of this project.) The Alberta Tar sands have shifted the balance of fossil fuel extraction to Canada, making North America both a net exporter of petroleum and the USA the top producer of oil. And yes, we even beat Saudi Arabia. Also Russia, which, if you dig into the Ukraine Crisis, there are probably petroleum undercurrents in that conflict as well. To be blunt, if the USA is the world's number one oil producer, it dramatically changes the authority that OPEC has held since the 1970's. Then, the OPEC oil embargo collapsed economies, brought down a presidency, and led to a decade of stagflation. Now, an OPEC tantrum would be problematic instead of a crisis. It might cause difficulty in some parts of the world, but the US and Europe would weather the storm, at least while the Tar Sands deposits can still be harvested profitably. The second change is much more significant. Country after country is transitioning to a fully renewable energy grid. Right now, the German region of Schleswig-Holstein is on target to be 100% renewable by the end of the year, with all of Germany and Denmark to be there no later than the year 2050. Even though that goal is 35 years away, the infrastructure is beginning to be put in place now to achieve that end. So taken together, the power of OPEC is likely going to be eviscerated if these trends continue. We have already passed a point of no return, at least right now, because, as I stated earlier, an Embargo would no longer have the desired effect. In fact, it would likely hasten the collapse of the petroleum regime. If they tried to cut us off, it would do nothing but spur more development of Oil Shale and Tar Sands, and also expand the push for renewables. So how do they combat this shift? Unleash the power of the market. This is, by the way, the same tactic used by Wal-Mart and Amazon to crush their competitors, just written on a global scale. Wal-Mart crushed local businesses by moving into small (and not so small) towns and underselling all of the competition. They could afford to take massive losses while they monopolized the market, making them up through volume and from distribution of profits from areas where they already had complete market control. Local businesses could not afford to run at a loss for months or possibly years, and so they folded, ceding the market to a single retailer. Amazon is still doing this, and has yet to turn any real profits while they are exterminating all competition. They are even going after Wal-Mart, because in the end, Wal-Mart will have to pay for brick and mortar stores that have to be constructed, maintained, powered and staffed. In the end, they will not be able to compete with a website, and the mighty retail giant will go the way of Montgomery Ward and Sears. But to return to the point, OPEC has a vested interest in killing off the upstarts. In this case, it is almost as if Wal-Mart, sensing what Amazon was about to do to them, turned the tables, and made sure that Amazon was bankrupted before it could execute its master plan. In the beginning of a market shift, the old players hold all of the cards. They also have two ways to fight back. One is through regulation and closing of the market via legislation. This, by the way, is the tactic that the Koch brothers are employing, by getting states to take actions like that in Florida, where, at this point, living off the grid isessentially illegal, and it is worthless to try to go solar. Coal companies are also trying this, to make it difficult to convert or replace coal fired power plants. By making it harder and harder to change the paradigm, they hope to stick the energy sector in amber and preserve their market share. Interestingly, this action is something that both the Far Right and the broad Left agree on; there are as many survivalists who are moving toward off the grid living as there are eco-warriors. When a broad spectrum of the American population agrees on a course, the people who are trying to legislate it into submission are generally going to lose. But, in the end, OPEC has no power to alter governmental policy, at least on the global scale. Therefore, they must fall back on a quasi-market solution. And that solution is to run the competition out of business. This is a quasi-market solution because it is a corruption of the "free market" of Adam Smith. In this case, a syndicate is functioning as if it were a monopoly because it is moving in lockstep. If any one of the members were to buckle, the scheme would collapse. However, at this point, that seems unlikely. So, in the end, what is going on is that OPEC is making all their competition unprofitable. The Tar Sands, and even more Oil Shale, require a certain market price to be economically viable to launch. There has to be a massive investment of capital into the infrastructure needed to even begin to extract the petroleum. If there isn't a clear indication of profitability, the investment capital will dry up or go elsewhere, possibly back to OPEC countries where most of the infrastructure and technology has been developed, and all that is needed is expansion. The Keystone Pipeline is a massive boondoggle for environmental reasons and because it will only produce a handful of permanent jobs, but that isn't the issue here. OPEC is going to kill off the project economically, by making it so unprofitable that no one will invest in it. As I said before, you have to have a certain expectation of return on investment, and if that threshold can't be met, no one will put money into it. They don't expect a guaranteed return, but if it is unlikely to turn a profit in the foreseeable future, the money will be invested elsewhere. And further, OPEC is doing this to all of the North American oil production. The new oil fields here are either going to cost a lot of develop, or they will cost a lot to extract. Tar Sands and Oil Shale are not easy to get, and require a high oil price to be viable. If OPEC can suppress those prices long enough to drive the upstarts out of business, they guarantee market dominance for themselves. Once the companies pull out of Alberta, and other areas, it will take a decade to crank it back up, and that is only if people think that the past won't be repeated. On the longer horizon, high oil prices make people more interested in renewables. When gas was pushing $5.00 a gallon, Toyota couldn't keep Priuses on their car lots. They sold as soon as they came in. As oil prices have dropped, sales of hybrids have declined. 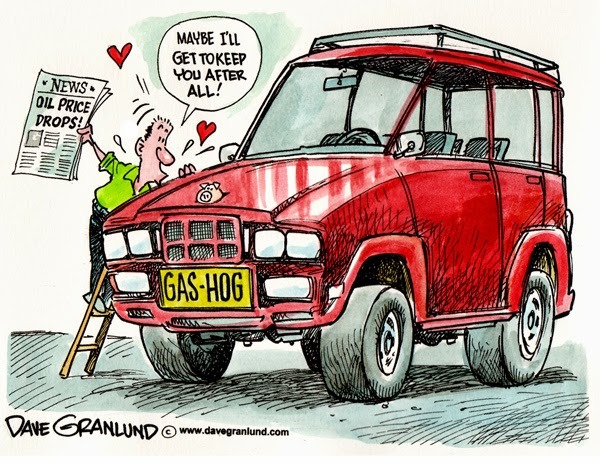 People aren't as concerned about gas mileage when gas is cheap. Similarly, when energy costs are high, wind and PV are very appealing, but when they are low, people don't see a return on their investment. Low electricity and gas costs mean that the PV array will never pay for itself; high costs mean a rapid return. And as with the oil field development, if you kill the viability of renewable energy infrastructure, it will take a long time to ramp it back up, and that is only if people don't think it is a losing proposition. And now we get to the final horror of how a cartel executes the killing stroke. They kill off their competition by driving them into bankruptcy with low prices that they can't match. Once the viable competition is gone, the prices go back through the roof, because the possibility of an upstart that could compete is gone. And this game will continue, lather, rinse, repeat, until no one challenges the hegemony. I'm not saying here that we should be pushing the domestic oil production, because it is a dead end road. What I am saying is that we need to fight back to preserve the renewable industry. Only the government has the resources, and the lack of profit motive, to fight back against the cartel and break it. By subsidizing the renewable energy market to the point that OPEC can't compete, we will do to the oil industry what Wal-Mart did to the local businesses. In the end, subverting the free market will actually open it wide. And that is the greatest irony of all.